Last year, Savannah Phelan was on the internet looking up the organization where her mother, Kellie, works as an advocate and mentor when she came across a video of Kellie talking about giving birth to Savannah while she was in jail. Kellie was seven months pregnant in 2007 when she was arrested on a misdemeanor drug possession charge and sent to New York City’s Rikers Island jail complex. Two weeks before her release, Savannah was born in a nearby hospital. At StoryCorps, Kellie recalled the joy of spending time with Savannah alongside the parents of other newborn babies in the hospital’s nursery, as well as the shame she felt at being shackled and wearing an orange Department of Corrections jumpsuit. Kellie was returned to jail while Savannah remained in the hospital a few additional days. Soon after, they were reunited and spent Kellie’s final weeks in custody together at the Rose M. Singer Center — a women’s jail on Rikers Island also known as “Rosie’s” — that includes a small nursery where mothers can stay with their children until they are up to a year old. After her release, Kellie and Savannah moved into Hour Children, a Queens-based nonprofit that provides supportive programs and transitional housing for women and mothers that have been incarcerated. Today, she works there as a program coordinator, mentoring youth whose parents are formerly or currently incarcerated, and often speaks openly about her own experiences. At StoryCorps, Savannah, 8, and Kellie sat down for one of the first times to talk about Savannah’s birth, and how she feels after learning that her mother had been in jail at the time. Savannah and Kellie’s conversation was recorded through the StoryCorps Justice Project, which preserves and amplifies the stories of people who have been directly impacted by mass incarceration. The Justice Project is made possible, in part, with support from the John D. and Catherine T. MacArthur Foundation Safety and Justice Challenge, #RethinkJails and the Robert Sterling Clark Foundation. Originally aired August 5, 2016, on NPR’s Morning Edition. 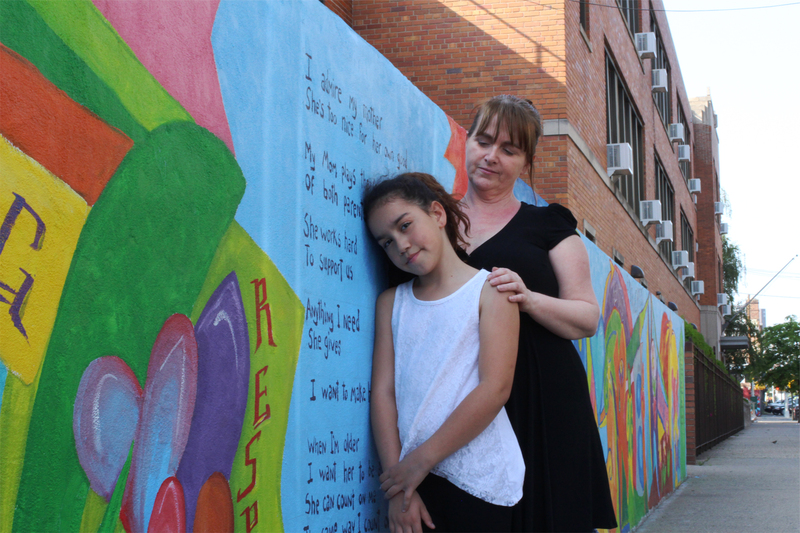 Photo: Kellie Phelan and her daughter Savannah in front of a 77-foot mural they helped paint that reflects the experiences of children and teenagers affected by incarceration. SP: Why did you go to jail? KP: Because I started using drugs when I got into an accident and I broke my knee. And that caused me to start taking pills that was prescribed from a doctor. But then mommy kind of got out of control with them and I wound up getting arrested. SP: What was it like to be pregnant with me in jail? KP: It was kind of lonely because I really didn’t have anybody then. And it was very scary. SP: When you were in jail and I first came out, who was I with? KP: You were born in a real hospital like every other baby that’s born, but then you came back to Rikers Island with me. So you stayed with mommy, because there’s a part of the jail for mommies and babies there. SP: What went through your head when you first saw me? KP: Oh my god, I loved you so much. And I just wanted everything in the world to be perfect for you. SP: I wanted to know why you never told me this stuff? Why didn’t you? KP: I guess I would have told you when I felt that you were old enough to understand. But I think that I was afraid to tell you, because it breaks my heart, and I get very sad when I talk about it. In the hospital, here I was walking into the nursery to see my beautiful baby, and there were other mommies and daddies seeing their babies, and here I was in this big orange jumpsuit and shackles. And I was really, really, embarrassed. So after you knew the truth, how did you feel? SP: It made me feel very sad because I don’t want you to be lonely. And I will never walk away from you. Mom, it feels good to be talking to you about this. It makes me understand why you went to jail. KP: You know, mommy had it a little rougher than you. My education wasn’t great when I was young, and that’s part of the reason I failed later on in life. But I don’t ever want you to be embarrassed or ever feel like you should be ashamed of where you were born, because you, you are my angel. You saved my life. And I will forever be grateful for you. Not everybody gets to save their mom’s life.